Italy; Late 15th Century. Latin Text; Humanistic Book Hand. This text on the Sententiae of Peter Lombard by St. Thomas Aquinas, the "Angelic Doctor," was the forerunner of the latter's great work Summa Theologica. It is most unusual to find the writings of a Church Father presented in a humanistic book hand. Some of the humanists called this form of writing antiqua littera, with reference to the carolingian script, which they mistook for that of antiquity. In this humanistic script, fusion disappeared, letters became more simple, and shading decreased. The first more or less humanistic type of writing appeared in Florence about 1400 A.D. 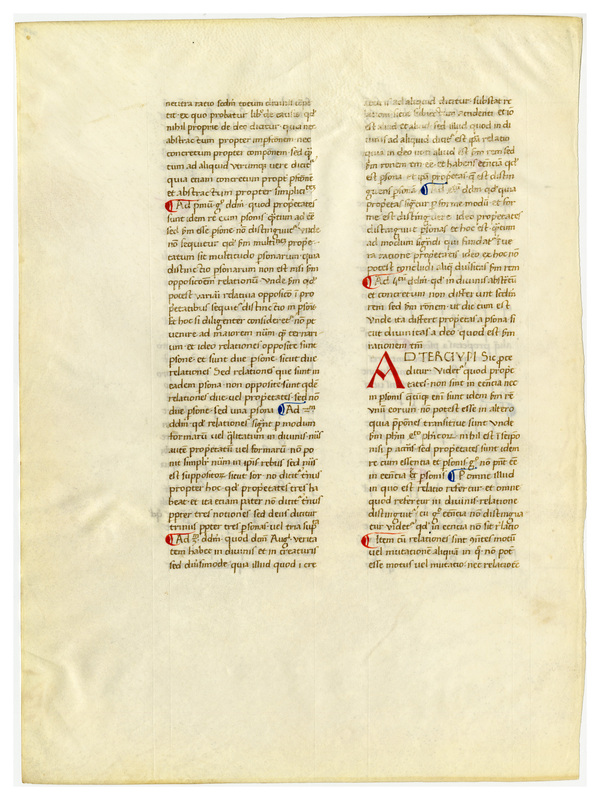 The text is clear but unadorned, except for red and blue paraph markers and three-line initials, the latter accompanied by majuscule letters. There is pencil foliation in the upper right corner of the recto. 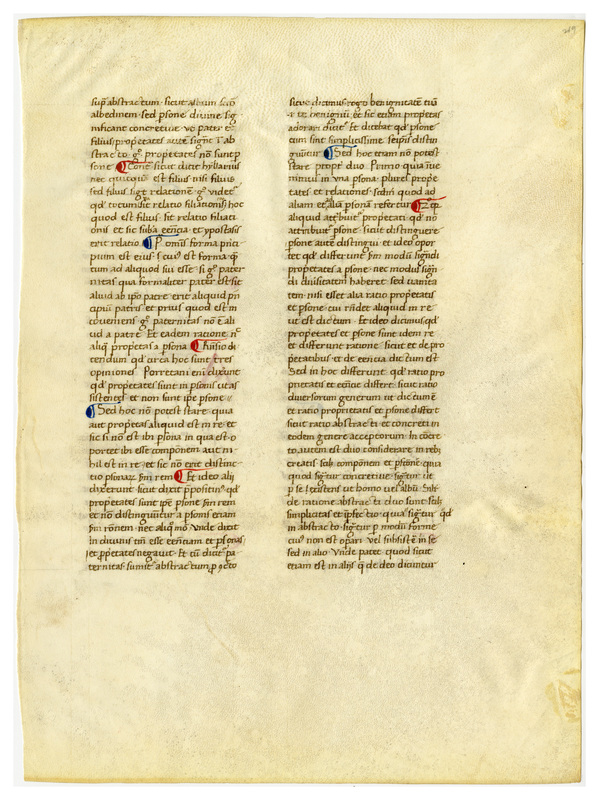 Text: This leaf contains text from Aquinas's Super Sententiis, lib. 1 d. 33 q. 1 a. 2 arg. 5 , to Super Sententiis, lib. 1 d. 33 q. 1 a. 3 arg. 3 . “E0040 Leaf from Thomas Aquinas, Commentary on the Sentences (Super Primo Libro Sententiarum),” Digital Exhibits | Denison University Archives & Special Collections, accessed April 23, 2019, http://exhibits.denisonarchives.org/items/show/60.